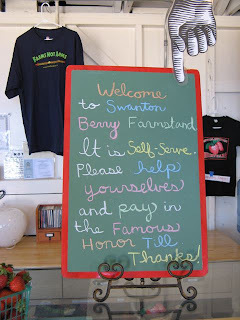 En route to Monterey from San Francisco, we discovered the Swanton Berry Farm and had the best strawberry shortcake in the world. 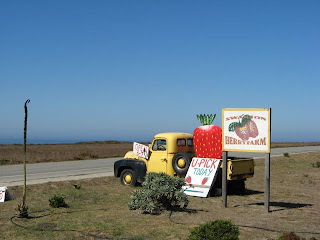 Real shortcake, fresh-picked organic strawberries (deep red, fragrant, naturally sweet), and thick whipped cream, eaten at a blue picnic table strung with cobwebs with a view of the ocean. I could swoon just thinking about it. 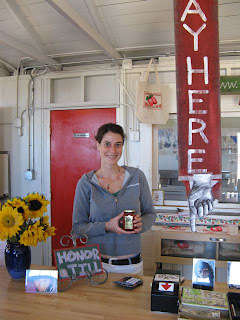 We stopped again on the way back to the airport and met the lovely Laura, who told us that Swanton is the oldest organic berry farm in California. Come in on a bicycle and get a 10% discount, but only if you're wearing a helmet.